Choosing the right keyword for a blog post is a challenge every blogger faces day in day out. Choosing the right keyword for a blog post could make the much needed difference every blogger dreams of. Traffic is the life blood of every successful blog and choosing the right keyword for your blog post can generate natural organic traffic for your blog. So today I want to discuss how to choose the right keywords for your blog post. A keyword could be a term or phrase is a word or phrase used by a searcher to search for relevant web pages. It could also be one or more words used by an advertiser in search engine optimization. For example an advertiser that sells computers might use “Dell Computers” as a keyword to attract more search engine visitors interested in Dell computers to his web page. On the other hand a visitor looking to buy dell computers would use the keyword or key phrase “Dell Computers” in search engines to match and locate the site with the specified keywords. Most times we limit the interpretation of keyword as a single word; it could actually be more than one word, it could be 2-4 words and then we call it a key phrase. Both are used interchangeably to mean same thing. So next time you hear keyword or key phrase they are both saying same thing. So the question remains ‘How do I choose the right keywords for my blog posts’? Keyword tools are resources that enables us to choose the right keywords and there are free keyword tools and paid keyword tools. I may not be able to tell you exactly how to use all the keyword tools on the internet on this blog post but I will at least list some important keyword tools here both free and paid ones. Google Adwords Keyword Tool: Google adwords keyword tool is indeed one of my favorite keyword tools on the internet today. This free keyword tool can help you find new keyword ideas, estimate traffic for existing and new keywords, and identify irrelevant terms to use as negative keywords. With Google adwords keyword tool, you can find keyword ideas based on a specific keyword, web address or keyword category. So if you are looking for a place to find the right keywords for your blog posts, I will recommend you start from Google adwords keyword tool as you will have the opportunity of using other Google’s resources like Google search and Google Insights for Search. SEMRush: SEMRush is a free and paid keyword research tool which gives exceptional insights into your PPC and organic keyword competition, rankings and traffic data. SEMRush is of course one of the best keyword tools on the internet today. It comprises of competitive keyword research tool, backlink reports and adsense reports. I won’t be dwelling much on these features for the purpose of this post, I will be concentrating on the keyword feature of SEMRush. SEMRush allows you to search for keywords on over 30 million strong databases, see your competitor’s common keywords, and estimate traffic on a keyword. This keyword tool is a professional tool and requires some amount of professionalism to totally understand and use. Like I said earlier, SEMRush offer both free and pro versions which make it suitable for any type of user. Bing Advertising Intelligence: This keyword tool may not be very popular for most bloggers but it is indeed an awesome keyword tool that allows you to build and expand on your keyword list on an excel interface. Remember Google is not the only search engine on the internet and their different search engines have different algorithms for their searches and thus treat different keywords differently, so you need to optimize your blog post with keywords that have strong cross search engine ranking factor so you can be seen as relevant in all search engines. You won’t want to rank #1 in one search engine and #200 in another; it will be nice to rank well for a keyword in all search engines. Bing advertising intelligence keyword tool enables you easily gauge the performance of relevant keywords, and leverage actual history and forecasted monthly search volumes for your keywords. There are other good keyword tools like Market Samurai, and Wordstream free keyword niche finder etc but I will have to stop at these three to continue on the topic. Now how do you know the keywords you chose is best for your blog post? Whatever your aim of choosing the right traffic for your blog post, a good keyword will drive massive traffic to your blog and will increase your ranking and as well make you more money ($$$). So in choosing the right keywords for your blog posts, there factors to consider. These factors are what make one keyword relevant and the other vanity. And as such you must take this section of this blog post very important. I will classify these factors into three – estimated amount of monthly searches, quality of traffic and competition. – Estimated amount of monthly searches: The estimated amount of monthly searches for a keyword is very important in deciding whether one should choose such a keyword or ignore it. There is no need ranking #1 for a keyword that barely gets 10 searches a month; in fact I’ll rather rank #5 for one that receives 5000 a month. The volume of monthly traffic for a keyword is very important, and I always place my minimum monthly searches for a keyword at 2000. This is definitely the first factor to consider in choosing the right keywords for your blog post. – Quality of traffic: As much as search volume is important in choosing the right keywords for your blog post, you have to also consider the quality of traffic it sends, if the advertising space on your blog is ad impression based you may ignore this factor and use keywords of any quality provided it sends huge impression on your blog, but if you are into affiliate marketing and is very concerned about the quality of traffic you receive on your blog since conversion is a factor of this type of traffic, you must seriously take this point into account. So in this case you will have to choose keywords that will result in higher conversion for your blog. – Competition: This factor is the trickiest of them all and the most important as well. Keywords with a very high volume of search will also have very high competitions. Make exact searches for your keywords using quotes on your keyword to check the search volume. 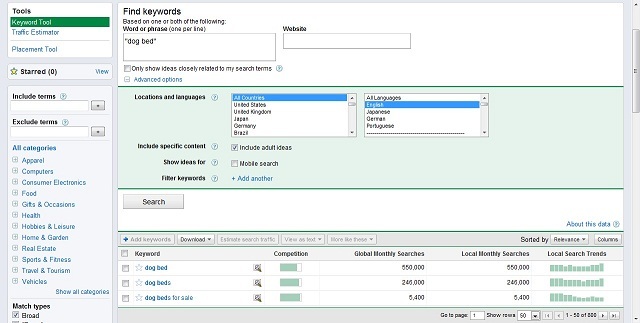 Example “your keyword”, you will notice that the most search keywords also have the most competitions. Now do you think you can do better than the sites on the first page of the search result for that keyword? Then you can enter the competition, but if you are a starter, I will recommend you go for keywords with lower competitions and reasonable traffic, rank for such keywords than get lost in a high competition keyword. That way you will receive reasonable traffic from search engine, and when you have several keywords like that and rank for them, aggregately your traffic will be bigger than when you try to rank for a high competition keyword and get lost in the process. Considering all the above, let’s assume you have found the perfect keyword for your blog post, how exactly do you use it effectively? Where and where do you apply it to ensure maximum effect on your post? This has been buried in SEO secrets for too long, and I will expose it for you to learn and I hope you apply it on your blog posts. – Always highlight your keyword in your post by either underlining, bolding or italicizing it. – Ensure you do not use more than 2% keyword density, though Yahoo and MSN may permit as much as 5% so anything between 2% – 5% will be ok. Please allow your keyword to naturally flow into your blog post, do not unnecessarily stuff your post with your keyword, people should be able to read and understand what you wrote, remember you are not writing for search engine but for people. Search engine is just a tool, so if you sound “gabbish” and stuff your post with keywords and make the post unattractive and difficult to understand, how can the visitor return another day? Remember your traffic base is not the new visitors alone but the returning visitors as well, so you must write to bring them back always just like I hope this post will bring you back as well. I hope I have been able to make one or two things clear for you to understand how to choose the right keywords for your blog post, so the next time you publish a blog post, consider all I’ve said here and you will see yourself at the top and your traffic will never dry. Do you have any other keyword tool other than the ones I listed here? Do you have an opinion about this blog post? Let me hear you; please use the comment box below to tell me what you think. Remember to subscribe to my RSS feeds if you will like to receive this type of posts on your email inbox so you don’t get to miss any of my blog posts again. Thanks am glad you found it interesting. That’ll be great….i assure you will find them even more interesting.